I grew up with horses, horse models, horse books and art by excellent illustrators like Sam Savitt and Wesley Dennis. Few artists today can match them, either in illustration or toy design. If you want good model horses, you look for Breyer, Hagen Renaker, Safari, Schleich, and CollectA. The odd Our Generation horse isn't bad either. And those old Johnny West models. And Hartland, back in the 60s. And some of the bouncy horses like Wonder Horses and Blaze. Not the Radio Flyer one (not too awful)... the 60s Mattel one, which is beautiful, if a fairly weird pinto. He might be a tovero (combination of overo and tobiano patterns). He very distinctly has a "badger face" (just google it). Most "toy horses" are pretty horrible, designed by artists who've never seen a real horse in their entire existence. You can still have fun with those. Repaint in realistic colors, or hit'em with spray paint (there are several like Rustoleum 2X and Valspar that stick to plastic). Some craft paints stick to plastic too (the multi-surface types by Folk Art and Americana are great). I've even used artist acrylics on plastic horses (the difference is artist's paints are translucent: designed to mix and make beautiful colors..., craft paints are like house paint: opaque, designed to cover objects). Paint 'em with ModPodge and throw sand at them to create "sand sculptures". Or glitter to create "snow sculptures" or Frozen ponies. Stick bling to them. Glue on feathers, felt or dog fur (shed from your pooch). 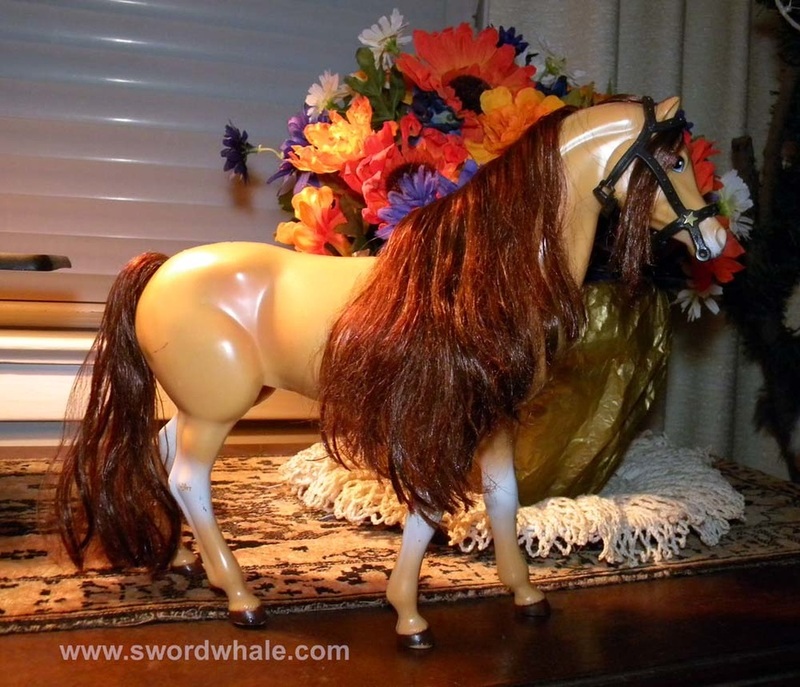 Here's one project I started with three plastic horses rescued by a friend. A big plastic horse, flocked, with rabbit fur mane and tail, in a fairly authentic dark dun or light bay...or something. The shaded knees and hocks are what would happen if a bay, dun or buckskin (all of which have dark points) had white stockings; the dark knees and hocks would show above the white stockings. The problem here is the white stockings are kind of foggy and faded (probably airbrushed on in the factory). A horse with white stockings would have light "horn or bone" colored feet. The anatomy is a little wonky. The left legs are sort of OK. The right legs are pretty awful. The anatomy is kind of awful, but this horse has such a wonderful attitude and expression that he deserves a fun makeover. Not likely to be paintable (without sanding off all the flocking), so probably a sand sculpture. That will also cover up all the awful ​"muscling" detail. 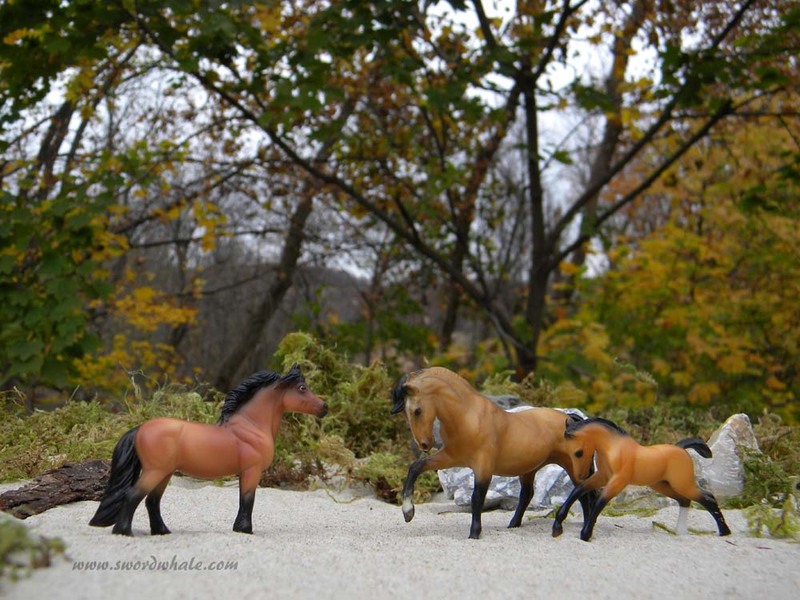 Here's a few Breyer duns and buckskins (Stablemate series, 1:32 scale) for contrast. 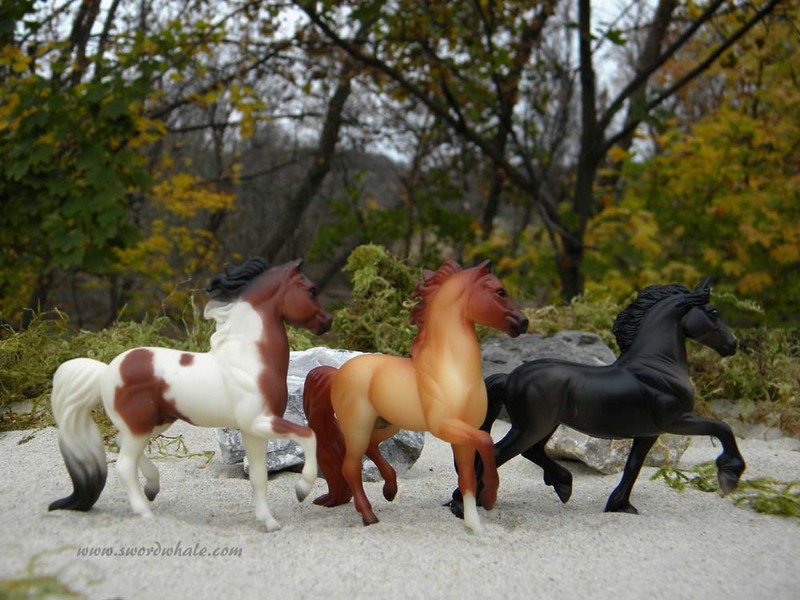 Compare anatomy and color: Below: three Breyer Stablemates in bay pinto, red dun, and black. These are 1:32 scale (fit in your hand). The Barbie horse is about 1:9 scale and has far less detail and accuracy. Nice overall shape, functional bridle (if not really totally accurate), hair needs help, awful lower legs, began as a nice attempt to do a buckskin or dun (two different sets of genetics, but similar appearance) but then someone blew it on the leg color... see Breyers above). Some duns, bays and buckskins have lighter shading mixed with the dark legs, making the knees, hocks and fetlocks darker, but it does not manifest as big fat black stripes on the knees and hocks. He's a nice shape and could look good in Oasis Blue or Lagoon. Or as a sand sculpture. Barbie horse. Actually functional bridle, not bad saddle (except for that weird loop on the front). Passable red dun. But whattheactualbleep is with the white blobs on the legs? Stockings are white markings that start at the foot and go up. Did I mention how annoyed I am with professional artists/designers who get paid for stuff and don't do their research??? I mean, just google it... Mr. google is your friend. Mane and tail just need some conditioner. Not sure if needs bright Oasis blue paint job or maybe I should just turn it into a sand sculpture. I note that the pinched shoulder is probably to allow unarticulated Barbies to ride the horse. I grew up with Barbies who could not ride my Breyers, because they weren't articulated the right way. Bah, humbug! This is actually one of the better Barbie horses. Her mane (cough) failing is a few anatomy details and the really dumb epic fail ( Mr Google is your friend) on the leg color... and that awful eye. So far all I've done on the red dun Barbie horse is wash her, and groom the mane and tail. And trim it a bit. And stick Bad Hair Day II's bridle and some hair over the horrible eyeball. Looks better already. I think this one will just get a realistic paint job. The body color and mane and tail are already a nice shade of red dun, so the addition of proper leg color (including the zebra stripes of a dun), dorsal stripe, and a correct eye and head color will make her look fine. Perhaps some detailing in the paint job on the body to cover up some of the anatomy goobers. Also might make a nice pinto, that way I would only need to paint white markings and fix the eye. Could also just turn her into a neat carousel horse (a stander) with the addition of trappings either hot glued on or made with air dry clay.